Looking for a girl hero in a middle-grade novel with a heart to protect the abused? 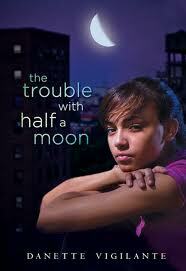 You'll find her in THE TROUBLE WITH HALF A MOON's Dellie (Putnam | 2011). The author, Danette Vigilante, grew up in Brooklyn's Red Hook housing project, and her "insider's" mastery of the setting magically transports us there. We feel the blue flakes on the playground benches, hear the sound of approaching sirens, basketballs dribbling, and neighbors' fights, and smell the antiseptic used by Dellie's mother to clean the elevators. Vigilante's first person tween voice effortlessly weaves in details about Puerto Rican culture in this debut novel. Dellie honors her hard-working, loving, strict parents, staying true to the culture's norms, even as she decides to break a few rules for the sake of someone in need. Perfect read to illuminate for tween girls that so-called "small" choices can make a difference in their own lives and in their communities.